My card today is for my very dear Uncle Tony. I realised it his Birthday this week and didn't think any of the cards in my stash really suited him. I wanted to have a card with a sweet sentiment on the front as he really is great and I don't tell him enough. So here is the card I must get in the post today! This card was initially inspired by the challenge at Fusion. It was the sweet sentiment on the front of the picture that got me thinking but I didn't a stamp the shape I wanted. I decided to use the wood frame, the bright colours of the green and purple flowers as inspiration and this turned into a kraft base and the colours of the checked stamp and green card stock lines. Very different than my initial idea but I guess this is how inspiration works. I got the layout from Seize the Sketch doing my own CAS version. This is a great card for a grown-up man - great choice of colors and design! I hope your Uncle likes it, it's very crisp, a great man card. Thank you for joining us at The Male Room. How fun is this!!! Thanks for joining us at Seize the Sketch. Love this CAS design! 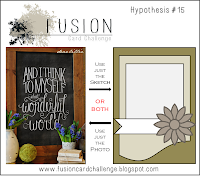 Thanks for playing along that the Sweet Stampin' Challenge & good luck! This is definitely a big boy's card. I'm sure your Uncle Troy will love it. Counting the hours now, my friend! VERY COOL design! The bright green strips really pop against the warmer colors!!! Ah...I'm sure your uncle will appreciate this! It's a great card! Thanks so much for joining us with it at FUSION! awesome combo of challenges! Thanks for joining us at Fusion & Seize the Sketch!